Amy J> Hyatt (right), the U.S. ambassador to Palau, shakes hands with President Tsai Ing-wen. Koror, Palau, March 23 (CNA) Two scholars believe that the presence of Amy J. Hyatt, the United States ambassador to Palau, at a banquet hosted by Taiwan President Tsai Ing-wen (蔡英文) on Saturday reflected growing ties between Taiwan and the U.S.
On Friday, Hyatt also attended a state banquet hosted by Palau President Tommy Remengesau, Jr. for Tsai, who is currently in Palau on the first leg of her tour of some of Taiwan's Pacific allies. Hyatt was seated at the main table Saturday, and her interaction with Tsai was limited to little more than handshakes and exchanges of greetings. 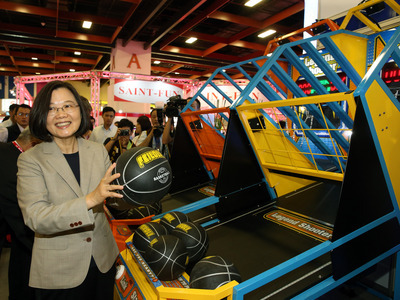 But Hyatt's presence showed the United States is putting great emphasis on Tsai's Pacific visit, Lai I-chung (賴怡忠), an executive board member of Taiwan Thinktank, told CNA. Alexander Huang (黃介正), an associate professor at Tamkang University, told CNA that the United States is seeking to strengthen ties with Taiwan as the balance across the Taiwan Strait tilts increasingly toward China. Aside from Hyatt's attendance at the banquet, several other moves indicate warming ties, Huang said. Taiwan and the United States on Tuesday jointly announced the launch of a new dialogue mechanism to achieve closer bilateral cooperation and to defend and promote shared values. Earlier this month, Deputy Minister of Foreign Affairs Hsu Szu-chien (徐斯儉) met with U.S. National Security Council Senior Director Matt Pottinger and the council's director for Oceania & Indo-Pacific Security, Alexander Gray in the Solomon Islands. Also, during a Micronesia summit in Palau in late February, U.S. Secretary of State Mike Pompeo praised Taiwan as a reliable partner and said Washington respects and supports Pacific nations' decision to continue to support Taiwan. The United States has no formal diplomatic relations with Taiwan but is the nation's most powerful supporter.